Shihan Ronald Moku Alo, born January 1, 1937, began studying with Professor William Kwai Sun Chow in January, 1953, at the age of 16. Shihan Alo was a very quick study and devoted student. On January 15, 1955, Professor Chow certified and notarized Shihan Alo to the rank of 2nd degree black belt (nidan) in Chow Kara-Ho Kempo. According to Shihan Julie Alo-Cromwell, Shihan Alo was the only certified instructor in existence within this system in the United States. Master Robert Trias, founder of the United States Karate Association (USKA) in 1946, met in the early 1960s with Shihan Alo to exchange ideas. Shihan Alo was awarded a black belt from Master Trias in 1962 through the USKA. In 1964, Shihan Alo moved to San Diego, California, to become a hand-to-hand combat instructor for the United States Marine Corps until 1968. This is where Professor Stan Mattson met Shihan Alo and started training with him. 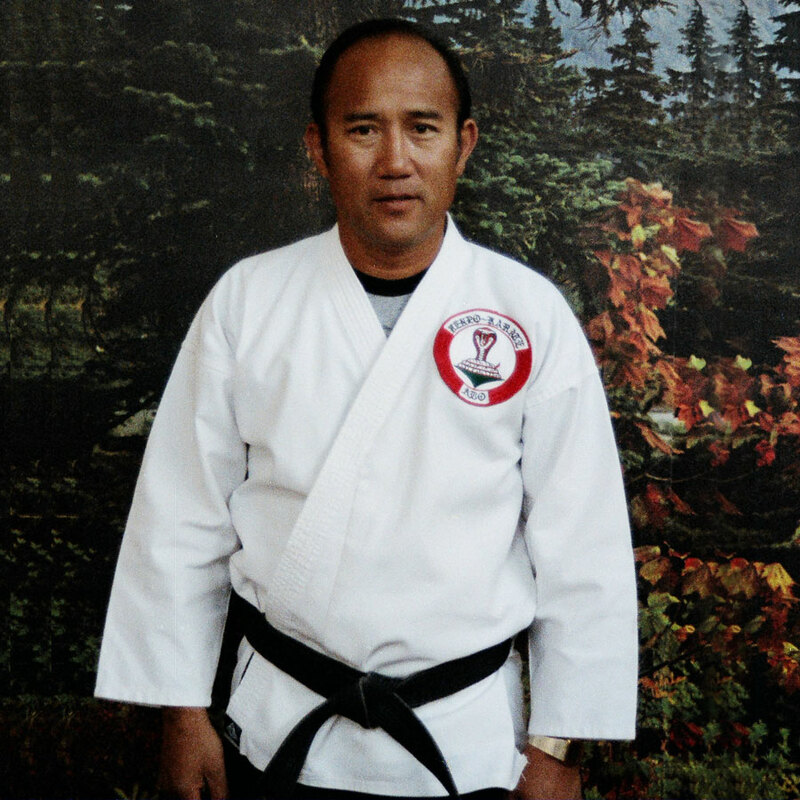 Shihan Alo was a 2nd degree black belt (nidan) with the USKA and was that organization’s military representative. From 1964 to 1973, he preferred teaching Kara-Ho Kempo, but after 1965 began stressing the inclusion of kata (forms), including three weapons kata in his curriculum so that his students could compete in USKA tournaments in areas other than sparring (kumite). Shihan Alo received his 5th degree black belt (godan) in 1974 from Master Trias (USKA) and his master rank (shihan) of 7th degree black belt (shichidan) certificate from Ed Parker (IKKA) in 1987. In June, 1969, Shihan Alo formed Alo Kenpo Karate Association (AKKA) in Anaheim, California. Almost simultaneously, he began significantly expanding the criteria to include elements of many arts not directly Kara-Ho or even Kenpo related, particularly kata. AKKA was comprised of many martial arts systems. According to Shihan Alo, ” Kara-Ho Kempo system kata were similar to Tai Chi. Professor Chow had a kata of 180 movements which is forgotten and lost to the world today.” Shihan Alo, being an admirer of both Nishiyama and Oyama studied to learn the Pinan kata. Shihan Alo also added the best of various Japan, Okinawa, and China systems and in the late 1960s with modifications, developed what is known as the 20 katas of the Alo Kenpo Karate Association. The interaction of a number of martial arts systems can be seen in the basics, katas, and self-defense drills. The techniques called fighting drills were formulated in 1971 to expedite teaching since westerners could learn faster with American physics and oriental theory. Shihan Alo explained, “Since I deal with the physical, mental and spiritual, it was easier to create a simplified method of teaching.” This textbook represents the traditional Hawaiian Kenpo as taught by Shihan Alo during this decade. In about 1977, Ron and his wife Julie began the arduous task of completely revising the criteria to be taught throughout AKKA. This was essentially completed and gradually introduced nationwide between 1983 and 1985. Shihan Julie Alo-Cromwell is currently the President and Co founder of Alo Kenpo Karate Association. There has never been any franchising within the AKKA system. Each person is allowed to create and expand the system, always adding new ideas but never subtracting from the foundation developed by Shihan Alo. On November 22, 1989 Shihan Ron Alo was diagnosed with leukemia and died October 5, 1990. Shihan Alo has personally ranked 20 individuals to black belt, including one female who was his wife, Shihan Julie Alo-Cromwell.